Yesterday during the holiday I had a chat with one of the visitor of Gerai Dinar at Depok…, this was the first time that visitor seen Dinar physically and fell in love immediately by transferring some of his savings in to Dinar. I would like to expose my discussion with that visitor; the reason maybe transferring your saving to Dinar might become an inspiration for the readers of this blog. Listen to his story; I come to a conclusion that he was worried that the value of his savings since several years ago will decline drastically, especially savings in Rupiah and or US Dollar. According to me the reason is exactly right and this message I shall convey it to the readers of this blog through the tag line: “Investment & Value Protection”. In my previous article, I wrote that Dinar as an investment only sits at number 2, but as Value Protection – Dinar is the best. To understand how Dinar works as a value protection, I take an example of the productivity of my colleagues which categorize as an Average High in both performance and investment. Currently his age is early 40s and started working since 1990. 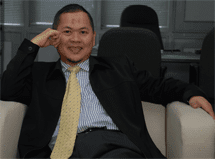 When he started working, his income was Rp.1, 000, 000, - net, now his income is Rp.37, 000, 000, - net per month. With his strong willing to be able to get a good education for his children and will have a comfortable life during his old age, he always put aside 20% of his income every month to be saving at the government bank. Last year his saving was Rp.1.033 billion. Is it a satisfactory result of his hardworking for several years? 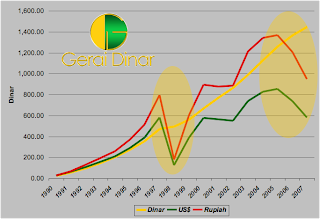 Lets see these two charts; from the Rupiah point of view – it is true that it is increase – but the increase is less than the Dinar increase. But saving in Rupiah still better than in US$ during the last 18 years – considering that profit sharing in Rupiah is far more higher than in US$. In Rupiah of course his saving continuously increased. Besides also get the interest (at first start with interest because Syariah Bank was still limited at that time, but then move to Syariah Bank and get a profit sharing), the savings value continuously increase because he put aside 20% of his monthly income to Bank. Let’s see now with a different parameter which is Dinar. Why Dinar? Because Dinar has a standard value that could be used as a parameter of real purchasing power in all eras. I have explained it in my previous articles, that price of crude oil statistics, one of the parameter of modern economic and also based on Al-Qur’an and Al-Hadits. 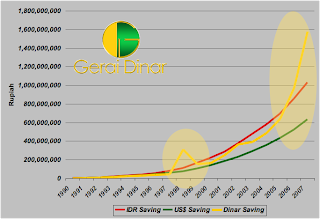 By change the Y axis of first chart from Rupiah to Dinar, it is clearly seen that since he start saving 18 years ago, the value was decreased twice. In 1997-1998 decreased drastically and suddenly and everybody in this country suffered the same thing. The last two years the decreased of banknotes to Dinar was also serious – but it happens gradually- most of us do not realize. Can you imagine with a hardworking and saving for many years in other to safeguard our future and our family future, in fact our wealth is wiped out gradually by inflation. This does not only happen in our country, but it also happens in a super power country. This analysis was also done by Larry Parks, Executive Director of FAME (Foundation of the Advancement of Monetary Education) which is an non government organization that is trying hard to create awareness of the American public the dangers of banknotes currency system. With full of confidence he give a message to American public: “With the Monetary system we have now, the careful saving of a life time can be wiped out in an eyeblink”.